Fencing is the ideal solution for many contemporary gardens. They are not just a means of marking out the borders of your garden, for example to create a barrier with the gardens of your neighbors. They can create the shape and feel of the garden too, especially when they are used as a feature and not a mere marker. There are numerous types of garden fences that are available these days, so fencing can fit in well with any sort of garden, no matter how traditional or contemporary it happens to be. 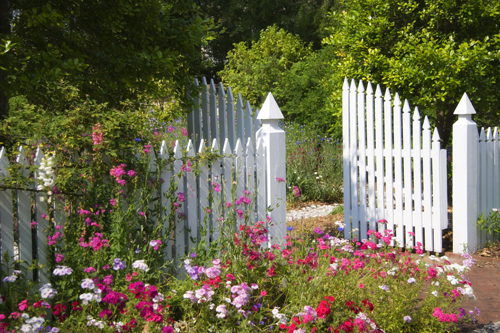 Indeed, gardens can have more than one design thanks to judicious use of fencing. Many American homes now have their gardens laid out in 'rooms' - for example, a space for seating and relaxing and another space for kids to play in or for planting to dominate. Let's look at the different sorts of fencing in greater detail and how each can be used in today's garden designs. Metal fencing looks great in modern gardens because it fits in well in both the natural and urban environments. Powder coated metal fencing panels can be manufactured in just about any color you choose, but bare metal looks cool and contemporary in a modern garden setting. Often free from maintenance for years on end, metal fencing is able to handle plants growing through it without weakening as well as providing a sturdy barrier to anyone tempted to access your property without permission. Stainless steel fencing is often brushed nowadays to provide a shimmering look which catches the light attractively and which sets of flowering plants beautifully. Vinyl fencing is often thought of as a low cost option for creating a garden wall, but there is much more to it than that. Firstly, vinyl fencing panels are usually sold in modular packs with upright pillars that are sunk into the ground. These frequently allow you to lay the panels out in a line or to turn through ninety degrees, as you wish. This system allows you to configure and reconfigure your fence depending on the changing seasons, or the changing needs of your garden. Simply lift a panel out and place it elsewhere. Available in gray and white, as well as some other colors, vinyl fencing sets off border planting well and provides much needed protection in exposed positions by cutting off the wind. Hugely popular all over the country, wooden fencing requires some maintenance to ensure it has a long life, but the natural material looks good in many gardens, no matter what their design concept happens to be. One of the great things about wooden fencing is that it comes in so many varieties. Need a short, foot high fence? There will be a product to suit. Equally, if you want eight foot high panels to provide you with privacy from a nearby road, then wooden fencing can provide the answer. When installing wooden fencing raise it a few inches from the ground so that it is not exposed to ground water, which will help to prolong its life. Underneath the fence panel, you can then fit a sacrificial board to block off access to weeds and plants from neighboring land. These boards can be changed after a few years, if needed, without the need to do anything to the fence panels themselves. Just apply wood preservative to keep your fence looking as good as new. Wrought iron fencing is a traditional looking solution for a garden which is also very good for growing plants. When planting is organized right next to the fencing in your garden, allowing light to come through is highly desirable. Otherwise, you need to set your garden out with shade loving plants or evergreens only. Since wrought iron fencing is usually manufactured with gaps between the uprights, there is plenty of light that is allowed to come through, making it ideal to install next to herbaceous borders and flower beds. Wrought iron fencing can be painted to any color you prefer, but traditional black iron fences look great in new homes as well as older ones. Like other forms of safety fencing, pool fences are designed with a function in mind, rather than a particular look. Nevertheless, many pool fencing products are very attractive these days, so it is certainly well worth shopping around for the best panels. Usually installed by being bolted to upright pillars or by being fixed directly into the ground, pool fence panels are designed to certain standards, making it hard for a child to climb over them. This means that they tend to have few, if any, horizontal element which might be used to gain purchase. Equally, their upright sections must be sufficiently close together to prevent a little one from squeezing through. Barring these design essentials, they can be made in various ways and from a number of differing materials.